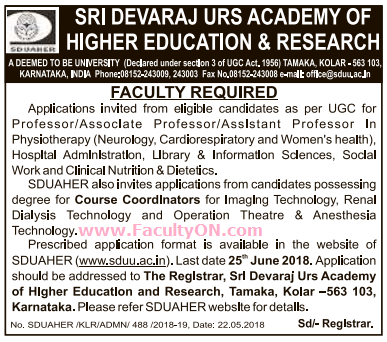 Sri Devaraj URS Academy of Higher Education & Research, Kolar has advertised in the DECCAN HERALD newspaper for recruitment of Teaching Faculty- Professor / Associate Professor / Assistant Professor jobs vacancies. Interested and eligible job aspirants are requested to apply on or before 25th June 2018. Check out further more details below. About College: In 1984 a group of dedicated and like-minded visionaries headed by Shri.R.L.Jalappa, Champion of Co-operative movement in the state of Karnataka established Sri Devaraj Urs Educational Trust for Backward Classes to focus on Medical Education and Social Service. The College is situated in Tamaka village (abutting National Highway No.4), 5 K.M. from Kolar Town, Karnataka. Kolar is well connected by road, rail and air due its proximity to Bengaluru, which is 75 K.M away. The nearest Railway Junction, Bangarpet is 15 K.M away from Kolar. 1. Pay scale of the academy commensurate with the best standards of similarly placed institutions. 2. All freshers will be awarded a consolidated pay package for initial one year of contractual service. Subsequently, salary will be fixed as per the academy pay scale. How to Apply: Interested and eligible candidates are requested to send application in prescribed format downloaded from college website with all copies of certificates / testimonials and recent PP size photos to the postal address mentioned below.